In the life of a monastery like Saint Joseph’s, today’s event is truly a milestone, an event for the history book. Professions happen just infrequently enough that, each time one occurs, it truly grasps the fullness of our attention. It calls each of us to reflection; it lifts our eyes and focuses them, for these all too brief moments, on a distant horizon…a horizon where time and eternity come together. In that regard, today’s profession – outwardly – seems decidedly different from that special moment in the life of Our Lord we celebrate today. Long after the world has put Christmas into its rear-view mirror, the Church, on this 40th day of Christmas, celebrates the Presentation of the Christ Child in the Temple of Jerusalem. We have heard the account in today’s Gospel…how it was written in the law of the Lord that every first-born male was sacred to the Lord and was to be presented in the Temple 40 days after his birth. It would have been quite a frequent ceremony, therefore…if not every day, it was certainly an often-repeated ritual that the priests would have known very well and performed regularly. And so it was that a couple drew near to the Temple to fulfill the prescribed rites…as so many had done before and so many would do after. Simple, ordinary seemingly. Certainly for our Heavenly Father, this ceremony was very different. God, who so loved the world that He sent His only begotten Son to it that it…that we…might not perish but might have eternal life, saw His Eternal Son, now wrapped in infant’s flesh, carried into the Temple, there to be consecrated for the mission that was His as Son and Savior; as Redeemer and fulfillment of all the prophecies…as eternal high priest and universal king…infinitely greater than David or Solomon. But, outwardly, how much it seemed one more of countless ceremonies performed day in and day out. Not so to Simeon who recognized what the human eye could not see or human sense perceive. He recognized this was radically different…by the gift of the Holy Spirit. Anna, the prophetess…who now spent the entirety of her life in fasting and prayer, always in the Temple day and night – she was also permitted to glimpse the divine reality which human eye could not perceive…by the gift of the Holy Spirit. We are called, in this liturgy, to look at what we shall see…not with human eyes, not with worldly perception, but with the vision of Simeon and Anna – and it is only by the gift of the Holy Spirit that we can recognize the momentous event that God is effecting as a young woman presents herself in this Temple of the Lord and is received and consecrated by the God we cannot see but who is ever at work in His Church. Our Catholic faith tells us that the liturgy is far more than a human activity. We don’t simply come together to remember events long past from this present moment and far distant from this place. No. The liturgy makes them present to us and makes us participants in them. When the Holy Sacrifice of the Mass is offered on this altar, Calvary is made present again. In an unbloody manner. By a different appearing. But the reality is the same: Jesus offers Himself, His body and blood, to the Father as the acceptable sacrifice – showing Himself at once to be the Priest, the Altar and the Lamb of Sacrifice. And He made this wonderful reality to be so in order that we, who are distinct from when and where He lived His life and offered His sacrifice, can truly and really participate in it. This is the reality of every Mass. But how incredibly real and how very specially is that so in THIS Eucharistic celebration that sees you, Sister, presented to God our Heavenly Father with Jesus in the mystery of His presentation. That sees you consecrated with Jesus in the mystery of His consecration. Jesus, who has chosen you for His own, who has taken you to Himself, is true God and true man. At one and the same time, sharing with us our human nature, truly man…yet never ceasing to be the Second Person of the Blessed Trinity. As man, He shares our life. He taught us by word and example. He suffered and He died. And you, Sister, your life will be a life of love and of praise for Him for the Savior, precisely in the contemplation and the companionship with Him in the mystery of His human suffering and death. • You will be his comforter in the Garden of Gethsemane when His own who walked with Him could not stay awake…you will keep watch with Him whom you love with all your Heart and who loves you with a love beyond human comprehension. • You will walk the way of the Cross, at His side. • You will be a Veronica, who wipes His face. • You will be a Simon of Cyrene, who helps to carry His cross. • With the holy women, you will weep for Him and comfort Him. • You will be crowned with His crown of thorns and spend yourself for Him who has loved you with an eternal love…a love for you which knew no beginning and will know no end…and it is that love, and your response to that love that has brought you to this day. This is God’s love for each of us…and you, Sister, testify to that by your consecrated life. The child we see today in Mary’s arms, however, is more than man…as Simeon and Anna insist in the Gospel. The Word who became flesh and dwelt among us never ceased to be God – whether as the baby presented in the Temple – or the man hanging upon the cross. How remarkable to know that as the baby was being presented, as God, He knew this moment. He saw it. And joined this presentation today to His own then. St. Thomas Aquinas speaks to this reality when He tells us that Jesus, being God the Son in human flesh, offered His life on the cross for each of us individually and uniquely. Each of our sins, He brought to the Cross. As God, He knew us, with all that we would be and all that we would do, all that we would choose. It was present to Him. He knows us intimately, far better than we know ourselves. And so, your religious life was present to Him and was His comfort and His consolation. By your vowed life, you will also stand at the side of His Mother, she who was at the Foot of the Cross, whom we contemplate in the Pieta…you will be her daughter in a special way and her companion, too. And, across the years, by the gifts of the Holy Spirit – and grace – you will come, ever more and more, to have her virtues, her disposition, her attitude, her love. Such is your vocation, Sister. You will be a mother to souls, especially to priests, but too many others, too, who will see in you a mysterious, a spiritual, a mystical maternity that is a sharing in the motherhood of Our Lady with whom you will be identified in a special way…she who was the Lord’s most perfect and faithful disciple, She who is always the companion of the Redeemer. • Your life will shine in the Church, for all who draw near to see it. But above all, it will shine for God, for whom you are consecrated. • Your life will be tied to the altar, just as these candles that adorn the altar. Much of your religious life will be spent at the altar of God, in prayer both public and private. • Your life will be spent and it will be consumed like these candles in the service of God and in aid to the souls He will associate with you. • Like the sanctuary lamp, which burns day and night, you will be, around the clock, a living hymn of praise to God. • But in addition to that duty of that particular candle, there is another: it points out to all who come near: “Look! He is here! The beloved whom you seek!” And that is your task, too. Your consecrated life as a cloistered nun is a life for the One to whom you are espoused but it speaks also to us. It speaks, though, in a language that transcends human words. It speaks to us through the new creation that you are made this day by the profession of vows…and by what the Holy Spirit does with those vows you pronounce. They originate in your will and find expression in your words. But, like the baby in the Temple, what is there and what is happening is so much more than the eye sees and the ear hears. As we say in the theology of the consecrated life, it is precisely in the moment, now at hand, when you pronounce the vows that inwardly the Holy Spirit consecrates you: consecrates you to God, consecrates you to His Divine Service, consecrates you by His Divine Love. You are constituted Christ’s bride. Interiorly, you are joined to Christ in a singular way. You are joined to His work of Redemption. And, as a daughter of Saint Paul of Cross, that consecration uniquely configures you to our Savior in the mystery of His Passion, His death, and the accomplishment of the Redemption. For all of us, each and every one of us in this church, the vocation to which we each have been called, be it as husbands and wives, be it as single people, be it as fathers and mothers or sons and daughters, be it in the world or apart from the world, as ministers of His Gospel or as laborers for Him in countless other ways is a response to Jesus who invites us to follow Him and to be like Him. The imitation of Christ is the summit of Christian perfection…but for you, dear Sister, it will have a special realization. Poor with the poverty of Jesus, chaste with the chastity of Jesus, obedient with the obedience of Jesus, you are called to live that imitation in an extraordinary way, even a heroic way, in a saintly way and you will grow day by day and year by year in closeness to Jesus and, by grace, come to be like Him more and more. From early morning until late night, you will come into His presence to sing His praise. You will be His companion, He who abides night and day as the Blessed Sacrament that resides there. You are for Him. Your life will be spent in intercession for the Church and for the world. You will pray for those outside this cloister, whose lives cannot spare all the hours you will spend with the Beloved because that is especially your ministry in the Church. You will be the sentinel who keeps watch when the rest of us do not. Only in eternity will you, and all of us, see how far and wide your life and witness will have reached as a cloistered nun. Our Holy Father, St. Paul of the Cross, for years longed for the establishment of the cloistered branch of his religious family. He knew, with the wisdom of the saints, how crucial you, the Sisters, would be for the Church and for the accomplishment of proclaiming the Passion of Jesus. There would be those who would go from pulpit to pulpit and church to church, from classroom to confessional preaching the Passion and bringing through the spoken word many, one by one, to the foot of the Cross, many to the Savior. But you, would preach by another way: by your life, by your love, by your sacrifices. Sister, as Mother prepares to take her place…as you prepare to pronounce your vows…the beautiful explanatory rites will unfold and we will see, with the eyes of the body, external expressions of the realities at work by the Holy Spirit who consecrates you and configures you as the Bride of our Crucified Savior. • We will see the veil and remember that in Old Testament and in New, the veil is a sign of the Divine Presence, of the Sacred. • The ring that expresses that you are now espoused to God and are, in your person, a living icon of the Church, His Bride and His Beloved. 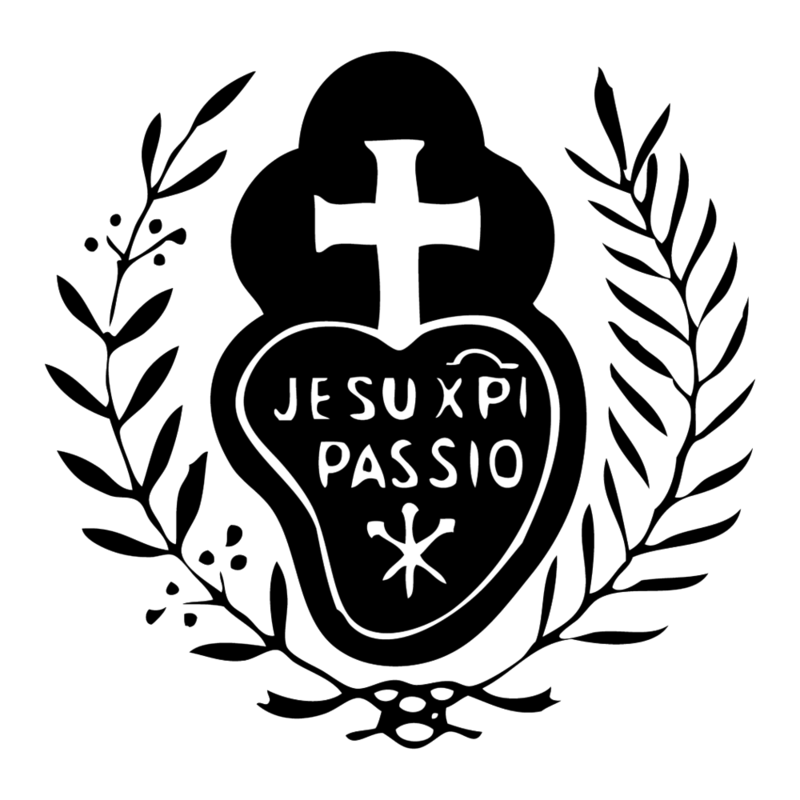 And the Passionist sign. Your heart, which you give to God, will, by Him, be made a heart new and transfigured…a heart engraved by Him and in which the Passion of Jesus will abide as in a living shrine. Dear Sister, I leave you with the thoughts of a great doctor of the Church, Saint Therese of Lisieux, also a cloistered nun of our own time: as a cloistered nun, your vocation will embrace every vocation. You will be associated with priests at the altar through your choir stall. You will be associated with missionaries around the world from your place in this cloister. You will be with the martyrs who give their lives for Christ and for the faith because you are their support through your prayers. Paradoxically, as you live your vow of enclosure, no place in the Church will be beyond you or your influence, for you will touch all by your prayer and by your life poured out at the foot of the Altar, at the foot of the Cross. God never allows Himself to be outdone in generosity and your generosity will touch the very heart of God. Yes, Sister, you have chosen the better part…for you will live at the very heart of the Church – and in the Church, you will be LOVE. Love for God, love for all humanity. The Savior’s love will have a face, a voice, hands, and a heart in you, for His people, as you live in the very heart of God, who is your Beloved. Pictures of Profession of Vows are Here!